I very rarely read romance, but one I read years ago as a teenager still stands out for me. 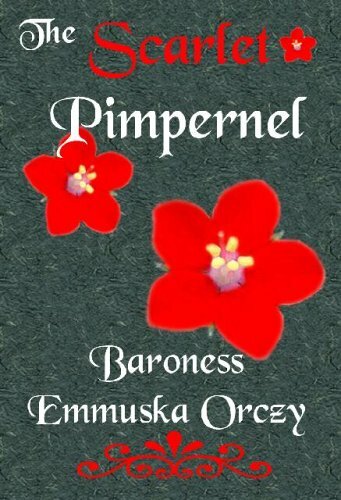 The book is The Scarlet Pimpernel by Baroness Orczy published in 1905. The central characters, Sir Percy Blakeney and Marguerite St Just, are already married, so it’s not a ‘boy meets girl’ story. It is a story about a marriage saved from going bad. Marguerite has come to despise her apparently foppish husband. What she doesn’t know is that he has an alter ego as the daring Scarlet Pimpernel who rescues aristocrats from the guillotine of the French Revolution. By the time she finds out the truth, her husband is in great danger. To warn him she follows him to France where he’s on another of his rescue missions. Of course, they are reunited at a point of high danger, but they realise the true depth of their love and then escape. Happy ending! Prep for the sequel – which I’ve never read! I think one of the reasons I liked this book was that it was about two mature people attempting to make their marriage a success against apparently difficult odds. It was also an exciting adventure with an exotic background. The novel actually grew out of a play (also by the Baroness), and gave rise to many sequels, short stories and, later, films. Baroness Orczy wrote a numerous other novels, many of which included daring and empowered women like Marguerite St Just. Percy’s chutzpah was probably one of the things that made him such a popular hero. Thank you for your memories of it and him. I’m not sure I’ll ever read the sequels now; my tastes have changed and if I hated them it might damage my happy memories of the original. I have a mental ‘enjoyed but never actually read’ category where I put books like that.